Clear deck inlay, abstract bottom & rails in a gloss & polish finish. Black full body pinlines around the deck inlay. Black and white logos. Single stringer of 3/16" Redwood. Nice forward swept 3/4 deck and fin patches. 2+1 setup with FCS Fusion sidebites and a center box; all fins included. 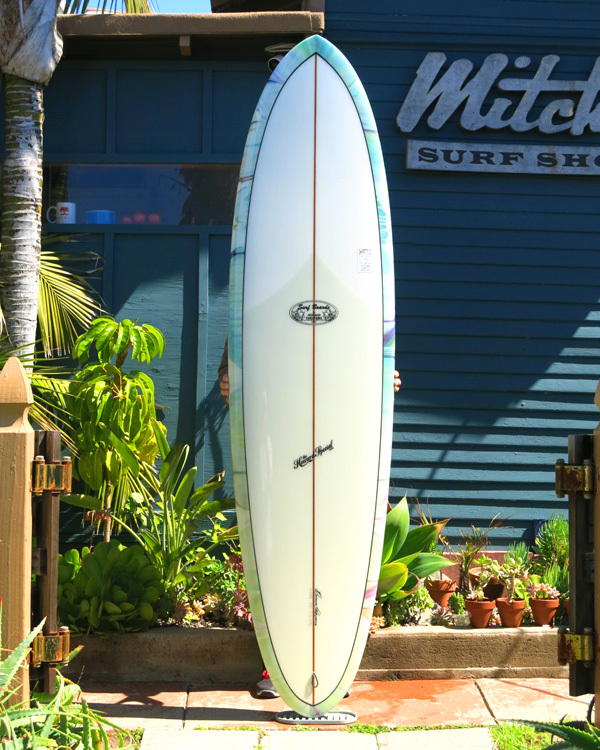 Length: 7' 2" Width: 21 3/8" Thick: 2 7/8"
Nose: 16 1/2" Tail: 15"
Donald's progressive mid-length Egg shape co-designed with Devon Howard, with a modified rocker for extra trim speed. Rounded pintail with 60/40 rails, and substantial "V" throughout the tail.